From Francis Cavanaugh’s daughter Gail. Our dad Frank Cavanaugh was born June 3 1921 in New York City. He was an only child. His father Charles had one sister, and his mother Mabel had a father, step- mother, and siblings living in New Jersey, but for some reason his parents never spoke about family, and so Frank grew up knowing nothing about any of them. In 1929 when he was 8 years old the Great Depression started. 1935 was a terrible year for Frank. He was 14 years old and his parents separated (not legally). He then was given the choice of who to live with, and he chose his father (for no particular reason, as he also loved his mother). For the next several months his mother would visit Frank every school day outside his apartment stoop before he went to school (after Charles went to work). She had to do this because Charles would not "allow" her to visit her son. One day she just stopped visiting. She never said good bye. Mabel was a good mother, so it was devastating for Frank. He had no idea what happened to her, or where she was living, and his dad never told him if he knew. To this day we still don't know what happened to Mabel, what year she died, or where she is buried. That same year (1935) his father Charles lost his job at the National Biscuit Company. When Frank wasn't hanging out with his little street gang of friends and getting into trouble, he spent an enormous amount of time escaping reality by reading adventure books at the NY Public Library on 23rd St. It was the beginning of a lifetime of being hooked on books. All his life he always liked to talk about the books he read. 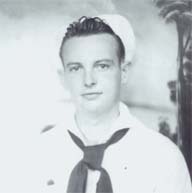 Frank enlisted in the navy when he was 17 years old. On April 15, 1939 he was received on board the beautiful battleship USS West Virginia, stationed in Pearl Harbor. He was in Paradise! It was the happiest time of his life! His navy buddies became the extended family he never had. He loved the great ship food and he could eat as much as he wanted! He was a skinny kid, and the navy wanted to fatten him up. He discovered that people ate spaghetti with sauce on it instead of plain! He loved the camaraderie, service to country, and of course the beautiful Hawaiian beaches!! Life was good. On April 9th, 1941 a new radioman came aboard the USS West Virginia. His name was Arthur Gould. He and Frank became fast friends. They were both radiomen, they both grew up in New York, and they both were only children. They had lots to talk about. Frank always loved to talk and tell stories about current events, the past, books, and about history, so they most probably talked a lot. Arthur told Frank that he had never been outside of New York, and he couldn’t believe how lucky he was to be stationed in Pearl Harbor. After only months in Hawaii, Arthur was given the shocking news that he was to be sent back to New York to be assigned to a different ship and a different location. He had to leave beautiful Hawaii!! Arthur felt totally devastated that he was unable to stay. Frank told him that he had one more year of duty in Hawaii to go, and he offered to request to trade assignments with him. Frank told Arthur he had enjoyed Hawaii for the past 2 years, and this way he could visit his father, and visit New York again. He was glad to do this kindness for his friend and fellow New Yorker. They applied for permission to trade assignments. Permission was eventually granted, and Frank left Hawaii and headed for Manhattan to await his new ship assignment. December 7, 1941: On a Sunday afternoon, shortly after arriving home, Frank was wearing his navy uniform and sitting in a bar on 42nd St. in Manhattan, enjoying a drink and chatting with his dad. They were listening to a radio in the bar broadcasting the game between the New York Giants and the Brooklyn Dodgers. The game was interrupted with a bulletin that Japanese forces had attacked and was continuing to attack the US Fleet at Pearl Harbor. The USS West Virginia was named as one of the battleships that sank! The glass that Frank was holding in his hand fell and shattered on the floor when he heard the news. Men in the bar saw Frank's navy uniform with the USS West Virginia on his navy hat and they all gathered around him to ask him questions, they were curious why he was in New York. Altogether 2,386 Americans were killed on that day. Arthur Gould RM3 was one of them. Frank visited Arthur’s parents after his death. It was the hardest thing he ever had to do. He said they were very nice, and kind, and wanted him to tell them everything about Arthur’s experiences in Hawaii, which he did. He especially felt sad that Arthur was their only child. He felt overwhelmed by their kindness and their sadness. Shortly after the war started he married Mary McDonnell, who came from a large Irish Catholic family. His father Charles died in Dec 1942 when Frank was 21 years old. He was at sea so he didn't get to say goodbye to him. He was grateful that he had Mary and her very large family in his life. After the war he worked for Bank of America on Wall Street, and after we moved to California he worked at the Main Headquarters of B of A in Los Angeles. He was head of the collections department until he retired. He died in 2005. He had a long, happy life and was much loved by his family (wife Mary, 5 daughters, 7 grandchildren, and 6 great-grandchildren)). He was a fun, interesting person. He never talked about the bad things he saw and experienced during the war, just told us kids about the funny things. It wasn't until his old age that he started talking about all the deaths he saw (he was assigned to a minelayer and later 2 destroyers during war). Toward the last years of his life, he would tear up talking about all his shipmates and all the fighter pilots that never made it home. He was proud of all of them. He was very sad about Arthur Gould dying. If they hadn't traded assignments, Frank would have been the one who died at Pearl Harbor instead of Arthur. We are very proud of our dad, and we are very grateful to Arthur Gould, who unwittingly gave life to our family. We regularly think about Arthur, and keep him always in our prayers.